Strength will come to you Emily. I have every faith that you will win this battle. Your life is inspiring and myself and my family think about you, pray for you and send positive thoughts your way everyday. Strength and faith to you and your family. You are truly amazing. Poor girl! Hoping and praying things turn around really soon. 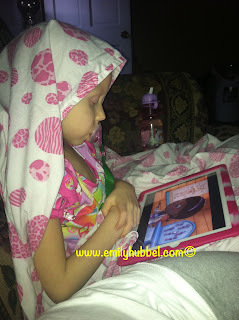 Sending love and prayers, sweet Emily! Hope you are able to eat more soon. When you are tired I hold you up in spirit asking God to help you feel better. And always praying for healing. I will NEGU hope for you. Sweet dreams and hugs! It is the 'lows' that make reaching the 'highs' that much sweeter and I have faith and believe that this will turn around for Emily so she can stay on the dosage for her last two rounds of the trial which is so important. It WILL happen and we WILL have victory! You all are in my prayers. I hate to hear that she's not feeling well. Prayers, as always.